This morning, Apple released free updates to Final Cut Pro X (10.4.4), Motion (5.4.2) and Compressor (4.4.2). This is the 28th free update to Final Cut since it was first released in June, 2011. There are a variety of new features in this update, here are the highlights. I’ll have tutorials on these new features in my weekly newsletter on Monday. Before you upgrade, make sure any 3rd-party plug-ins you are using are compatible. I am getting email notices from companies indicating potential problems. All current developers are working on updating their tools, but, to be safe, check their websites before you upgrade. Most of these updates should be completed in a few weeks. 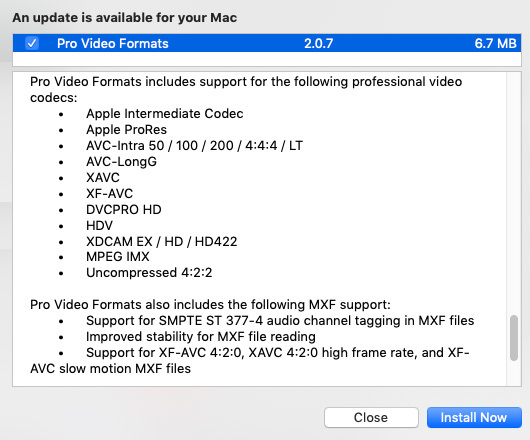 You will also need to upgrade your Pro Video formats, and this does NOT show up in the Mac App Store. Instead, go to: System Preferences > Software Update. The current version of the Pro Video formats is 2.0.7. The headline feature is Workflow Extensions. 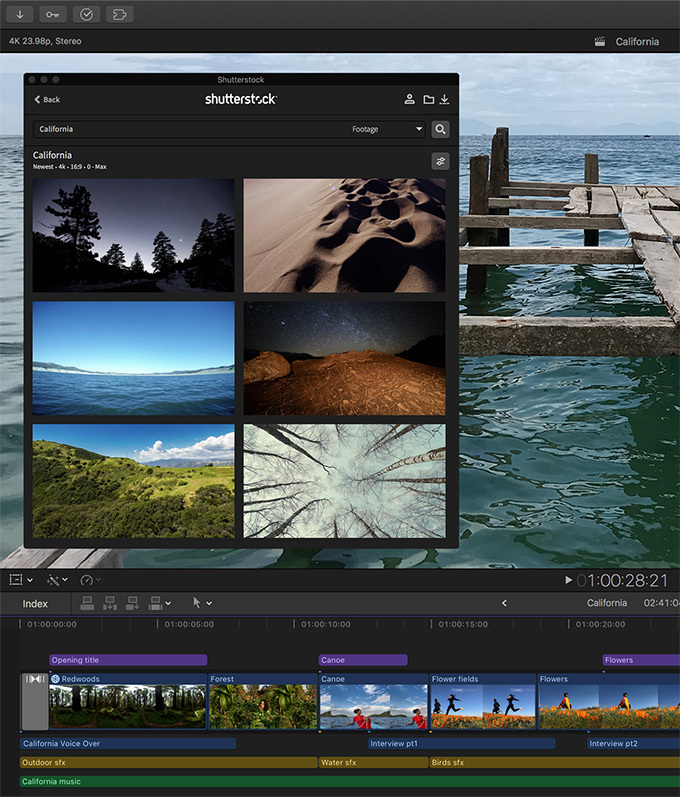 Similar in concept to plug-in panels in Adobe Premiere Pro CC, these extensions allow 3rd-party developers to add functionality directly in Final Cut. For example, dragging assets directly from the extension into the timeline or browser. Extensions open directly in the interface without the need to launch a separate app or browser. They are designed to match the look of Final Cut Pro for a native experience with third-party tools. And extensions integrate tightly into the features of Final Cut Pro, allowing you to drag clips or projects between the extension and your library, navigate your timeline, and more. Launching this morning with the FCP X update, are workflow extensions from Frame.io, Shutterstock and CatDV. The Frame.io extension combines the core functionality of Frame.io with the advanced editing tools in Final Cut Pro X. 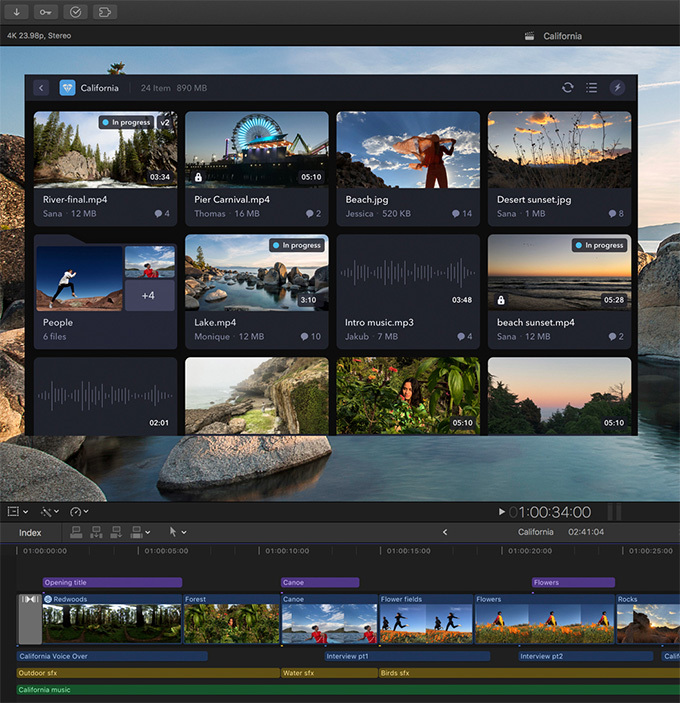 Developed in collaboration with Apple, Frame.io in Final Cut Pro X is the first collaborative video review toolset that can be accessed right in Final Cut Pro X.
Shutterstock also announced a new integrated workflow extension for Final Cut, offering more than 250 million video, image, and music assets available for license. This custom-built extension is the first multi-asset API tool Shutterstock has launched. Workflow extensions can be downloaded free from the Mac App Store starting today. 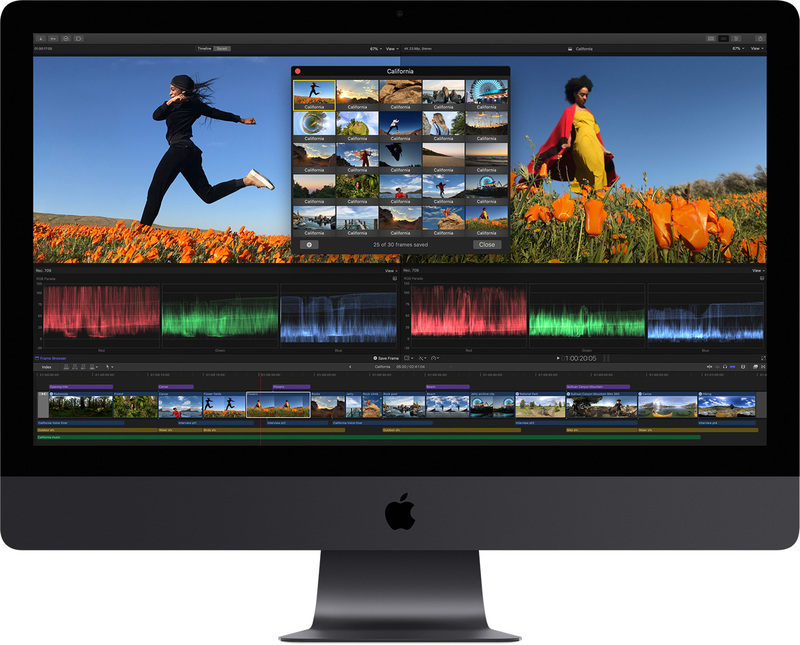 Additional third-party extensions for Final Cut Pro X will be available on an ongoing basis. These workflow extensions are supported by an Apple API and SDK, which is available to all interested developers by contacting Apple Developer support. 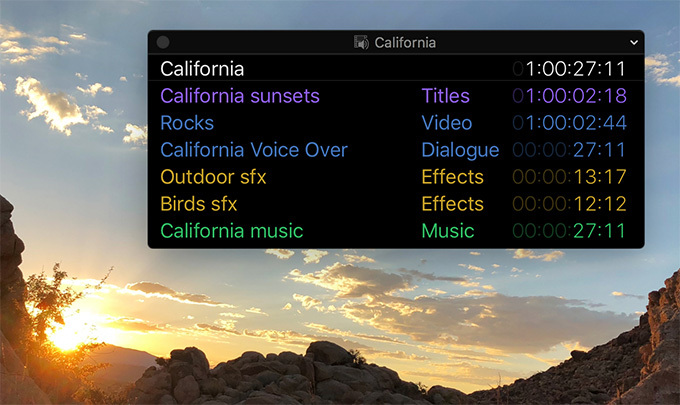 A new floating timecode window makes it easy for video editors to know where they are by displaying color-coded clip names, roles, project timecode, and source timecode in a customizable, resizable display. Batch sharing (exporting) which allows a user to export multiple clips or projects in one step. This can be especially useful when transcoding dailies on set for quick turnaround or delivering multiple versions of a project. Comparison Viewer, a new window that lets editors view reference still images while color grading to ensure a consistent look across their project. Similar to a frame store which holds multiple images, you can refer to a stored source image while adjusting another. High-quality video noise reduction minimizes artifacts in low light or archival footage. Simple sliders allow restoring sharpness after noise reduction. Closed captions now support SRT format captions, which is the preferred format for Facebook and Instagram. Captions can now be burned into the video for compatibility with a wide range of video websites, as well as toggled on or off. Improved, more intuitive marquee selection of connected storylines and clips. A new tiny planet filter that transforms 360° video into spherical animations that can be keyframed to change over time. Motion adds a comprehensive set of color grading tools including color wheels, color curves, hue/saturation curves, and custom LUTs. However, there are still no video scopes in Motion. A customizable Comic effect filter that instantly turns any image or video into color or monochrome comic book illustration. Compressor was rewritten to a new 64-bit engine that takes advantage of all the memory in a user’s Mac for improved performance when encoding high resolution, high frame rate video, while still maintaining support for 32-bit codecs, to allow working with key legacy formats. Compressor now supports SRT closed captions. SRT is the preferred caption format for Facebook and Instagram. Improved hardware encoding for H.264 and HEVC formats. As usual, I recommend never updating in the middle of a project. Finish the project, then update. Also, there’s no harm in waiting a few days to make sure there are no hidden bugs in this new version. Let others not under a deadline test the product. Once you know the software is good to use, feel free to update. All upgrades are free and available now in the Mac App Store; extensions from Frame.io, Shutterstock and CatDV are also available today in the Mac App Store. I’ll have tutorials and more coverage on these new features in my weekly newsletter on Monday. Man, you’re always on top of it! Many thanks and hope y’all are safe and back in your home. Thanks for the update on the update Larry! You’re the man! Have a happy Thanksgiving! Any details on “Improved hardware encoding for H.264 and HEVC formats.” ? So, Prof. Jordan, are there other features that should be better or are missing in this latest version? Thanks for keeping us on top of these events — and happy thanksgiving. Smile… what user DOESN’T have an opinion on new features? Still, there are things in this release that puzzle me – though it’s more of a philosophical discussion than a checklist. I want to work with the new version a bit, then share my thoughts in Monday’s newsletter. I like comparison view, it brings back something similar to color correction view of fcp7. But It would be nice if apple started fixing the timeline. Simple functionality that allows professionals to edit like professionals. It’s so frustrating to be editing and not be able to manipulate clip required at a high level without moving mountains. All these metadata upgrades and color coding options just don’t do it. Something as simple as doing a overwrite edit of video only that doesn’t delete the audio track that’s already there would excite me more than a noise filter. Couldn’t agree more on the overwrite edit of video (where the sound is already detached) but still gets lost when selecting only the video to replace or delete. Drives me nuts when I didn’t “Notice” soon enough and have to go back and back and the forward redoing work I’d done up until I noticed. That seems absurdly infantile at this point of development. Then again, it could be related to some deep function I know nothing about that makes it a harder problem to solve that it appears on the surface. And I DO love FCPX for my educational videos. I quite agree with the 2 previous comments. It’s seems all the be about forcing editors to think in a particular way. When the fact is that everyone has their own way of working. A professional editing suite, to my mind, should allow as much latitude as possible. For my way of moving things around, I really miss the ‘select all to the right’ on one or multiple tracks. I’ve read in multiple places “you shouldn’t need it if you are editing the right way”!! Astonishing. There are amazing things about fcp x, true. But so many things take longer and some simply cannot be done properly at all. Larry, very interested in your thoughts on the “Legacy Media” warnings. I’ve yet to find a complete list of what Apple deems Legacy Media. I’ve gotten the pop up warning on libraries that only have Uncompressed 10 bit 4:2:2, MXF MPEG-2 and WAV files. Apple tech couldn’t clarify what media is triggering the warnings. If we don’t know what media will be unsupported, it sure makes planning for that very difficult. I, too, am intrigued. I’m in the process of researching this and hope to have a fuller report in about a week. I’d like to research the possibilities of the extension framework to see whether this can be leveraged to implement a bespoke solution for a large FCPX user. I contacted Developer Support (through the ordinary channels), and they do not seem to be aware. Would you have any background information that could help me to get to the right people at Apple? Good question. I’ve reached out to Apple to learn which part of Developer Support you need to contact. I’ll let you know what I find out. Larry – Thanks so much. Apparently I was not able to locate this form myself… I have submitted the reqest – let’s see whether I hear back. If so – and if allowed to – I will be happy to share my views. Thanks again for the link and just to give you an update on the matter. I filed the request back in November and never heard back. I can only speculate, but as they ask for the website, they perhaps are not interested in giving access to integrators working on bespoke solutions for a small number (though significant) clients but want to focus more on companies that aim at extending larger-volume products with these workflow capabilities. I would also not be surprised if the SDK is not stable and well documented enough at this stage, which woukd require lots of support by Apple for those that implement solutions, and they want to focus while the SDK stabilizes, planning to be more open only later. What’s worse is that one of my more important clients has now kicked off a feasibility study to move off the Mac platform, citing dissatisfaction with the hardware portfolio and a “lack of clarity regarding Apple’s roadmap“. We’ll see where this ends.